Cedar Rapids, IA - The Cedar Rapids Kernels have three ways for your non-profit group or organization to raise money this season - before, during and after Kernels games! Selling Kernels tickets is an easy way to raise money for your team or organization! Each 4-Pack of tickets sells for $30.00, and you get to keep $10.00 of each sale. That can really add up with just a few sales! The 4-Pack consists of four plaza ticket vouchers, which can be redeemed at the Kernels box office for any home game during the 2015 season. Who to sell to: Mom and Dad, Grandparents, Aunts and Uncles, Neighbors, Teachers, Coaches, Your parents' co-workers, People at church. How it works: The Kernels supply a form for you to track your sales during the fundraising period. People purchasing a package complete their personal information and the seller collects $30 for each 4-pack sold. Cash and personal checks made out to the Cedar Rapids Kernels are accepted. Your group coordinator will turn in all orders to the Kernels and in 3-4 weeks, the Kernels will mail out all ticket vouchers and cut a check back to your organization for the total amount raised. Questions? Please contact Sammy Brzostowski at the Cedar Rapids Kernels by phone at (319) 896-7622 or by e-mail at sammy@kernels.com. 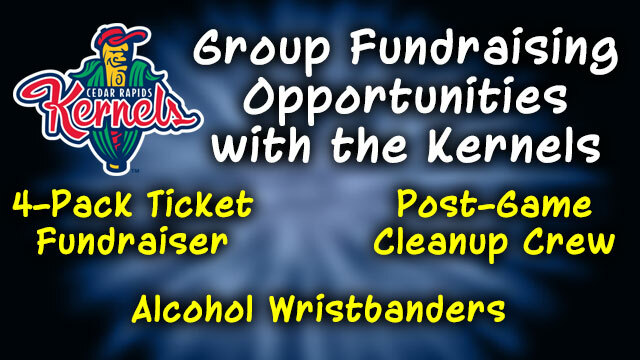 The Kernels are looking for non-profit organization to man alcohol purchase wristbanding stations at various locations throughout the stadium at all 70 Kernel home games. People who wrist band should be at least 18 years of age and be able to verify a customer's ID and issue a wristband so they may purchase and consume alcoholic beverages at the stadium. The wristbanders must be at their posts when the gates open one hour before the scheduled first pitch, but may leave the game upon the completion or the 6th inning (at the latest). The number of wristbanders needed at each home game varies and the number needed will be sent to the group leader. For more information about wristbanding, contact Scott Wilson at the Kernels by phone at (319) 896-7612 or by email at scott@kernels.com. The Kernels are looking for non-profit organization to assist in the post-game cleaning of Perfect Game Field at Veterans Memorial Stadium following Kernels games. Cleaning crews will pick up general trash from the main seating bowl and group areas, separate recyclable items, such as soda and water bottles from the general trash, put the items into the proper bins and take them to either the bottle storage area or trash compactor. The cleaning crew will also empty the various trash bins from around the stadium and return them to their usual location. The cleaning crew will arrive at the stadium approximately 30 minutes before the end of the game and the cleaning process takes between 60 and 90 minutes following the end of the game. A cleanup group will earn $125 per night cleaning the stadium and most groups commit to a home stand, consisting of 3-4 consecutive games. For more information about post-game stadium cleanup, contact Scott Wilson at the Kernels by phone at (319) 896-7612 or by email at scott@kernels.com. The Cedar Rapids Kernels open the 2015 Midwest League season on Thursday, April 9th at Kane County. The 2015 Opening Day is Sunday, April 12th at 4:05 pm when the Kernels take on the Beloit Snappers. Season ticket packages and 10-game coupon books are on sale now with individual game tickets going on sale Monday, March 23rd at 10:00 pm. Contact the Kernels at (319) 363-3887 between the hours of 9 am and 5 pm to purchase season tickets or coupon books.